UPDATE AS OF 12/4: Crossroads College Prep Jazz Ensemble will no longer be able to perform on Thursday December 6 or December 13. The holiday spirit has hit Metro! 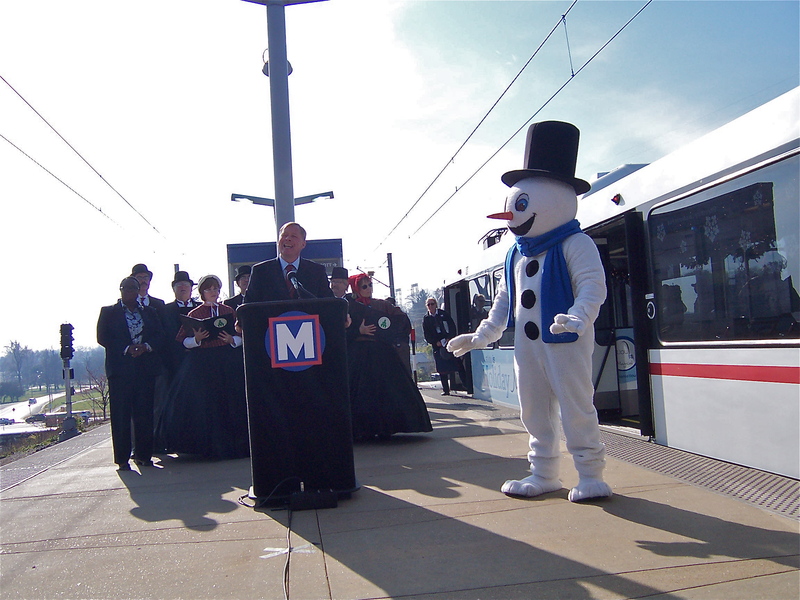 Today some Metro customers and the media got a sneak peek at this year’s Holiday Magic Train. 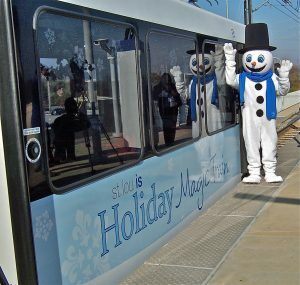 The Holiday Magic Train is a partnership between Metro and the St. Louis Convention and Visitors Commission (CVC). This is the third year we have teamed up to present the very popular Holiday Magic Train. The decorated train is a winter wonderland of blue and silver ornaments and white snowflake ornaments with garland. Snowflake decals decorate the train windows and big holiday wreaths adorn the front and back of the Holiday Magic Train. CVC and Metro employees decorated the train yesterday morning. To view pictures click here. Metro Communications Director Dianne Williams, CVC Chief Marketing Officer Brian Hall, and the CVC Holiday Magic mascot Snowflake rode the Holiday Magic Train to the Shrewsbury MetroLink Station to greet customers and welcome them aboard. The looks on passengers’ faces were priceless: Some were confused, some were excited, and all were smiling! 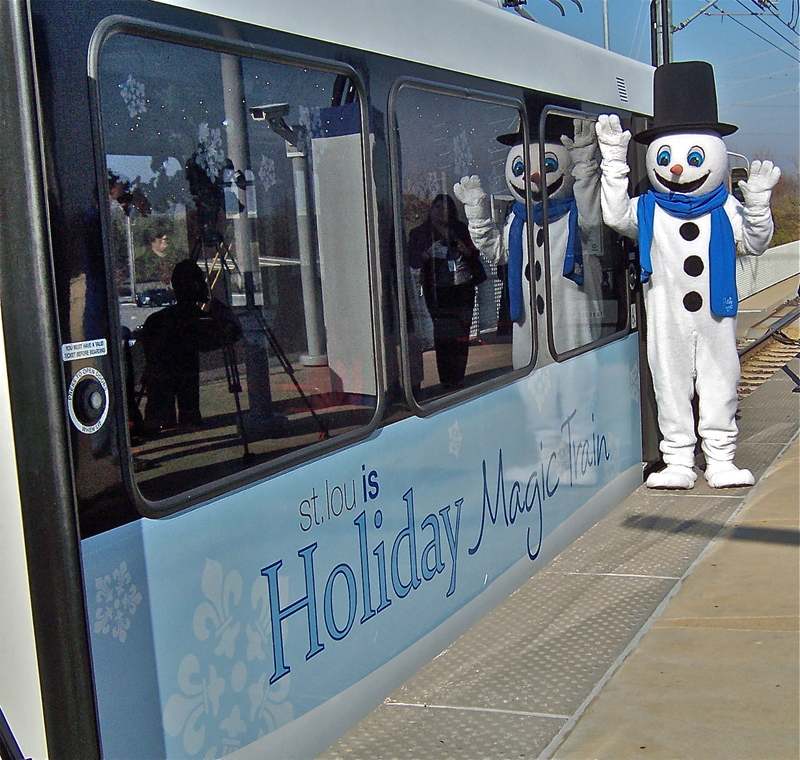 Snowflake, Hall and Williams arrived on the Holiday Magic Train at the Shrewsbury MetroLink Station shortly before 10:30 a.m. this morning. 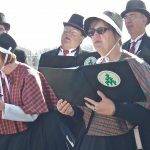 All of the customers aboard the train were greeted by the cheerful sound of holiday music sung by the St. Louis Christmas Carols Association. 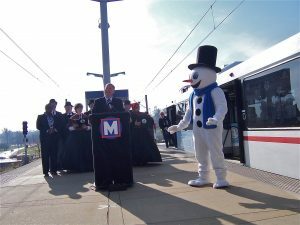 Williams announced that this year there will be even more festive holiday music along the MetroLink system. 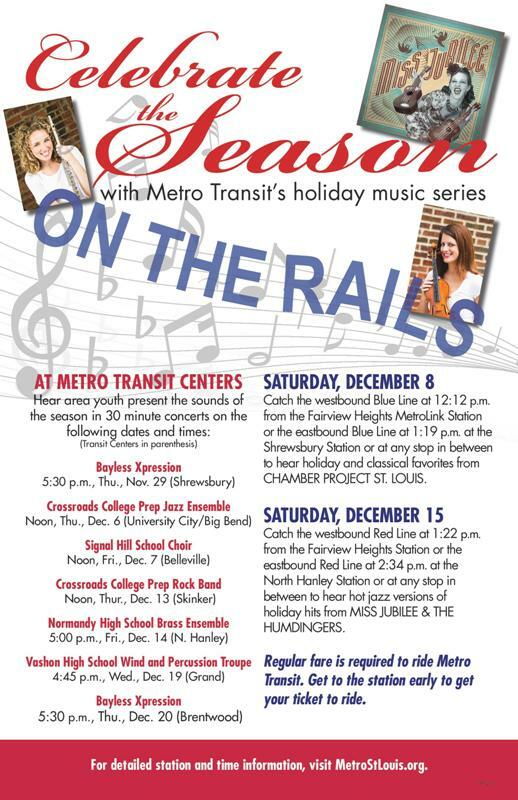 On Saturday, December 8, classical duo “Chamber Project St. Louis” is scheduled to perform from 12:12 p.m. to 2:11 p.m. on the Holiday Magic Train which will be on the Blue Line from Fairview Heights to Shrewsbury and back. On Saturday, December 15 you can hear the hot jazz sounds of “Miss Jubilee and the Humdingers” on the Red Line between Fairview Heights and Lambert-St. Louis International Airport and back to Fairview Heights from 1:22 p.m. to 3:21 p.m.
You can join the concerts by using your Metro pass or buying a ticket to ride anywhere along the route. At the Metro Transit Centers, youth from five bi-state area schools will perform 30-minute concerts at several Metro Transit Centers. The Xpression group from Bayless High School will sing at the Shrewsbury MetroLink Station at 5:30 p.m. on November 29 and at the Brentwood MetroLink Station on December 20 at 5:30 p.m. 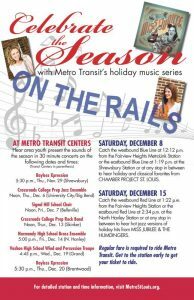 The Crossroads College Prep Jazz Ensemble will perform at noon at the University City-Big Bend MetroLink Station on December 6 and Crossroads College Prep Rock Band will perform on December 13 at noon at the Skinker MetroLink Station. 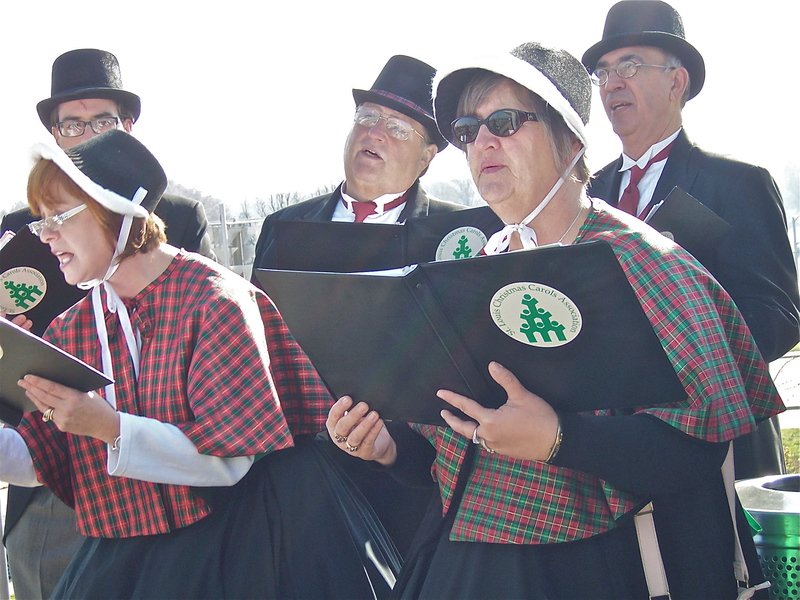 The Signal Hill Middle School choir will perform on December 7 at 9 a.m. at the Belleville MetroLink Station. On December 14 at 5 p.m., the Normandy High School Brass Ensemble will perform at the North Hanley Transit Center. The Vashon High School Wind and Percussion Troupe will perform at the Grand MetroLink Station at 4:45 p.m. on December 19. The Holiday Magic Train is scheduled on the Red Line on November 23, 25, 26, 28, 30 and December 1, 3, 5, 7, 10, 12, 14, 15, 17, 19, 21, 24, 26, 28, 29, and 31. It will be on the Blue Line November 20, 24, 27, 29, and December 4, 6, 8, 11, 13, 18, 20, 22, 25, and 27. Hall invited the community to come and enjoy the Ameren Missouri Thanksgiving Day parade Thursday morning in downtown St. Louis. He also announced the CVC’s popular and family-friendly Holiday Magic event at the America’s Center begins this Friday, November 23 and runs through Sunday, November 25. During Holiday Magic this year, there are tons of activities for kids and adults. Children can have their photos taken with Santa, check out performances by the Purina Incredible Dog Team, play with some critters at a petting zoo, and watch a culinary demonstration by Lumiere Place Casino & Hotels and River City Casino. Kids can ride on 10 full scale carnival rides and a trackless Holiday Magic train. There is a kid’s activity area where the little ones can get their faces painted, build a birdhouse with the Carpenter’s Union, play in the Rams Pass, Punt and Kick Zone, Paint-a-Poinsettia, decorate a holiday cookie and so much more. Game will also be provided by Radio Disney. While at Holiday Magic event, don’t forget to check out, my personal favorite, the photo booth! For more information on Holiday Magic Click Here. To view more pictures from the unveiling of the Holiday Magic Train click here.